Eduardo "Lalo" Guerrero was one of eight surviving children of a family twenty-seven. 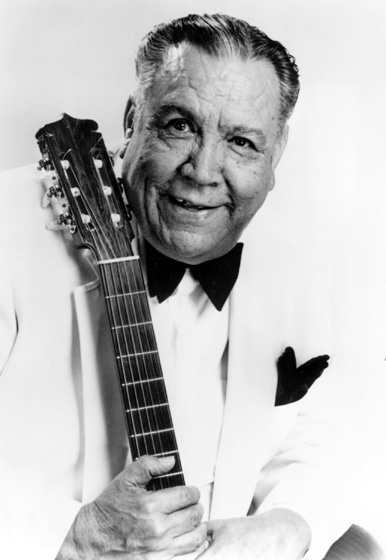 While growing up in what is now known as the Barrio Histórico area of Tucson, Arizona, he learned the rudiments of guitar playing from his mother, Concepción Guerrero, a traditional singer and guitarist. After teaching him a few basic chords, his mother taught him Mexican songs, and Guerrero taught himself to play the family piano. He remembered that as a child, he entered a music contest in which all the schools in town participated. "We competed with high school kids and we won—two girls and myself. The little school from the ghetto. We won and we won first prize. That was the first time I really got some confidence and I felt like somebody." Guerrero did not venture outside his Mexican American neighborhood until he entered junior high school and began learning about the Anglo world of Tucson. When he was 16, his father moved the family back to Mexico. While there, Guerrero learned new songs from a cousin, Danny Guerrero. The family was unhappy in Mexico and returned to Tucson within a few months. In 1933, Guerrero left high school to help support his family. During the height of the Depression, his father was working only three days a week for the Southern Pacific Railroad. To earn extra money, Guerrero began playing guitar and singing in bars with two friends, brothers José and Soledad Salas. After Gregorio Escalante joined the group, they named themselves Los Carlistas. Because there were so few paying jobs, they went from bar to bar playing for tips. In 1937, Guerrero and his group moved to Los Angeles. They began singing, along with other popular singers of the era, for a radio show broadcast from the stage of the old California Theater on Main Street. This exposure led to more jobs. They played at Omar's Dome on Western Avenue, had a small part in the movie Boots and Saddles, with Gene Autry, and recorded songs for Vocalion Records. After two years in Los Angeles, the group returned to Tucson, where it was well received. In 1939, the Tucson Chamber of Commerce sponsored the group’s first trip to New York for a performance at Radio City Music Hall on the Major Bowes Amateur Hour radio program. Guerrero said, "For Mexicans, New York City in 1939 was like the other side of the world — nobody had ever seen any Mexicans." Los Carlistas won the talent contest and continued working for Major Bowes playing Mexican music for about six months. That same year, Guerrero married his first wife, Margaret Marmion of Tucson. After his successful stint in New York, they moved back to Los Angeles, but their stay was brief. One of his fellow musicians drowned, and Guerrero returned to Tucson to play on his own. He went to work at the El Charro club, playing for wages plus tips. He sang there for over a year and a half, until the United States entered World War II in December 1941. Guerrero wanted to join the Army but didn't want to leave his wife and young son, Danny. He chose to do "essential war work" at Convair in San Diego during the day and entertain at military camps and hospitals at night. When the war ended, he and his young family went to Los Angeles, where Guerrero joined another group, El Trio Imperial. He also recorded for Imperial Records. After he had played with El Trio Imperial for nearly three years, the record company took Guerrero out of the trio and made him a soloist. Guerrero's first solo recording, a 78-rpm disk made in 1948, featured him singing Augustine Lara's "Pecadora" and Manuel S. Acuna's "Mentira." The record hit the top of the charts and established him as a major recording artist in both the United States and Mexico. He began alternating engagements at Los Angeles nightspots with tours throughout the West and Midwest. In 1956, record and song royalties enabled him to buy his own nightclub on Whittier Boulevard. Over the next twelve years, the club in East Los Angeles featured some of the best Mexican and Mexican American entertainers. Guerrero sold the club in 1968 and opened another in Tucson, but it wasn't as successful. In 1973, the Delgado family invited him to open its new club in Rancho Mirage, California, near Palm Springs. A year later, Guerrero remarried and settled with his new wife, Lydia, and her two children in Palm Desert. He continued to play nightly at the club through the 1970s. In addition to his career as a performer, Guerrero was a composer. Imperial Records recorded more than 200 of his original compositions. He was multilingual and wrote lyrics in English, Spanish and pachuco, a dialect of 1940s Southwestern Chicano youth. Moreover, his composition style evolved over the course of his career, beginning with romantic songs and topical corridos (ballads) and growing to include canción cómico (comic songs) and parodies. His lyrics often contained messages of social awareness, most notably proclaiming the significance of Mexican American culture. His compositions about the pachuco era produced a string of hits and generated interest in the pachuco dialect. Some of these songs, including "Los Chucos Suaves" and "Vamos a Bailar," were used in the musical play and film Zoot Suit. Through his lyrics, Guerrero also addressed social and political issues, such as discrimination, labor struggles and the Vietnam War. In 1997, he received the National Medal of Arts. He continued to perform until shortly before his death. Guerrero, Eduardo "Lalo." Vamos A Bailar-Otra Vez with Lalo Guerrero. Break Records, 2000. ____________. Homenaje a Roberto Kennedy. Vintage Music, 2015. Guerrero, Eduardo "Lalo," with Los Lobos. Papa's Dream. Music for Little People, 558CD. Las Ardillitas De Lalo Guerrero. Feliz Dia Del Nino Con Las Ardillitas De Lalo Guerrero. Capitol Latin, 2004.